If iCloud has been acting up for you today, know that it’s not just you. 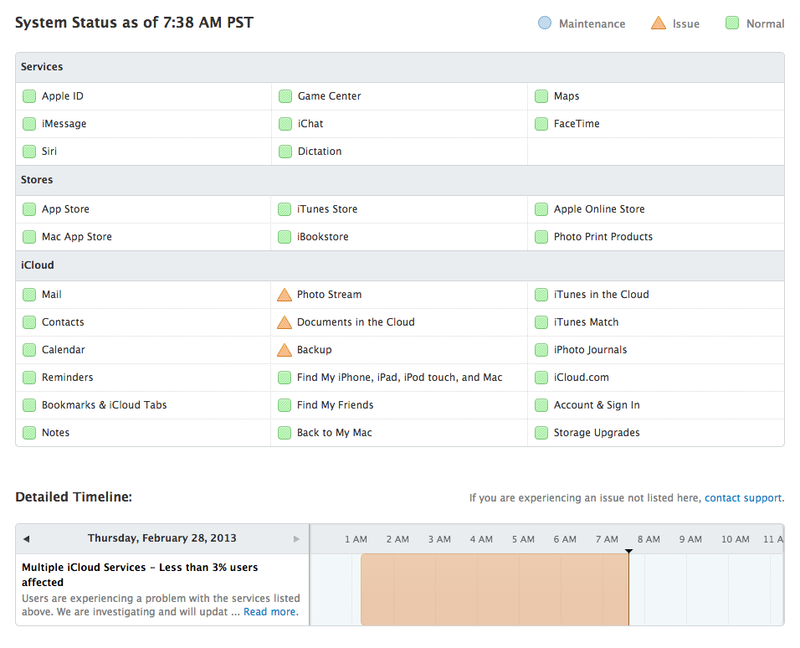 At least three iCloud-based(s AAPL) services are currently experiencing problems, according to Apple’s own system status page on Thursday morning. The current issues extend to Documents in the Cloud, Photo Stream — the service that syncs photos across Apple devices — and iCloud backup. The outage has been going on for seven hours. As of this posting, the iCloud hiccup is affecting three percent of users, according to Apple’s status report. But earlier reports Thursday indicate iCloud had an even bigger issue. Anyone having problems with iCloud mail ? 9to5Mac took a screenshot of Apple’s system status page about two hours earlier, which showed that there were issues with all iCloud services, from Mail to Calendar, Find My iPhone, iTunes Match, account sign-in and more. That was said to affect more than one in 10 iCloud customers. Apple’s cloud service has taken off pretty quickly: it opened in October 2011, and as of the beginning of 2013 had 250 million users. But Apple’s struggled at times to keep iCloud running smoothly as more users signed up and as the company has integrated iCloud with more of its software. Update: Apple said the outage was resolved at 11:45 a.m. PT. Apple’s cloud service has 250 mill users? Source?